Green Grandma: Vinegar Friday -- Anyone laying tile? Vinegar Friday -- Anyone laying tile? With so many of us trying to save money, we're doing more and more DIY projects. Right? We sit down and watch a YouTube video, gather our supplies, and get to work. Well, that's what a lot of you do. Me? I'm more of a hire someone kind of person. My daughter and her husband, on the other hand, tackle as many home projects as they can. That's how I learned about today's vinegar tip. Have you ever grouted tile? If so, you know all about how messy it can get. And before you can call the project finished, you have to remove all the grout residue smeared across your lovely new tiles. So what do you do? 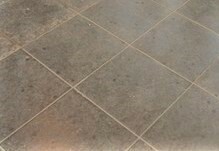 Most people would head to Home Depot or Lowe's and purchase something with hydrochloric acid like Stone Pro Quick Clean or any number of other products that remove grout, none of which are cheap. And let's face it, if you weren't concerned about the cost, you wouldn't be laying the tile yourself anyway, right? And let's not forget the whole thing about breathing in toxic fumes as you work with these chemicals. Yikes! But there is a toxic-free, earth-friendly solution. And you already know what I'm going to say. On three... VINEGAR! My son-in-law discovered this while laying a ceramic tile floor in their kitchen a few years ago. Just one part distilled white vinegar to three parts water in a bucket. Wipe and repeat. While the other commercial products took several tries, the vinegar and water method takes only two. Was it a fluke? Just last month, my son-in-law laid another tile floor; this time in the bathroom. Then he grabbed the DWV and a bucket and cleaned up the grout residue in two easy steps. Yeah, vinegar is awesome like that. No fumes, no harm to the environment, and less work. Much less work. Today, we're singing the praises of vinegar once again, with a tip for you DIY kings and queens. Before starting a project, make sure you have a gallon of DWV on hand. You never know when it might come in handy! You can find more great vinegar tips in my book, VINEGAR FRIDAYS. Click here to purchase. As a DIYer, this is a great idea; not only saving money, but making the floor look perfect. Thanks. Gina's Soft Cloth $50 Giveaway! Making Health Happen with Hyland's!